How does my legal partner work? 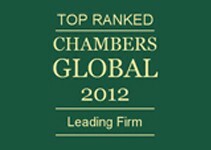 We are pleased to inform you that the new edition of Chambers Global: The World's Leading Lawyers for Business was published in March 2012. Our experts have again been recommended in several categories. The following partners were also recommended in these categories: Magdalena Skowrońska (Banking & Finance), Krzysztof Zakrzewski - (Corporate/M&A), Prof. Grzegorz Domański, Józef Palinka and Paweł Lewandowski (Dispute resolution) oraz Aleksandra Auleytner and Janina Ligner-Żeromska (Intellectual Property). For over 20 years now Chambers has carried out annual interviews with lawyers from all over the world and their clients in order to select the best specialists on the market. Assessment criteria are mainly: experience, project engagement and professional client approach. The Life Sciences Practice led by Dr Marcin Matczak was recommended in the recently published PLC ranking in the Life Sciences: Regulatory category, taking a higher position than last year. From 25 May 2018 the General Data Protection Regulation (GDPR) applies in Poland and other European Union countries. We would therefore like to give you several details on the subject of how DZP processes personal data. The administrator of the personal data is Domański Zakrzewski Palinka Sp.k. (“DZP”; address: Rondo ONZ 1, 00-124 Warszawa). Data are processed for contact purposes and to impart information on changes to provisions and authority practices and on other issues, including events concerning day-to-day legal, economic and cultural issues, inter alia, by sending DZP newsletters. The above is carried out on the basis of legitimate interests, i.e. in accordance with art. 6(1)(f) of the GDPR. Data can also be processed where necessary for the conclusion or performance of a contract and for compliance with a legal obligation to which DZP is subject, i.e. pursuant to art. 6(1)(b) and (c) of the GDPR. Data can be transferred to entities with whose help DZP achieves the indicated aims, including entities maintaining IT infrastructure. Giving data is voluntary and in contractual relations is a requirement for concluding and performing a contract. It is possible to object to data processing, request access to, rectification and erasure of personal data or restriction of processing and data portability. Data are kept until an objection is made, and in contractual relations – throughout the term of the contract and thereafter for a period specified in provisions on archiving and limitations period for claims. Anyone has the right to file a complaint with the President of the Personal Data Protection Office. Questions concerning privacy at DZP can be sent to DZP’s Data Protection Inspector, Macieja Maciejewskiego, at: iod@dzp.pl. New rules on cookies: Domański Zakrzewski Palinka sp.k., as the service provider of the www.dzp.pl website, stores and accesses cookies, i.e. small text information fles sent by a web server and stored on your hard drive, or other data storage medium of a user, for the purposes of: proper functioning of the www.dzp.pl website, confguring the www.dzp.pl website, security and reliability of the www.dzp.pl website, session monitoring, providing advertisements, personalization of the displayed information to the user, or analysis, statistics, research and website trafc auditing.